Ottawa Humane Society: Walkers are the Tops! Several weeks ago, at the media launch for our upcoming Wiggle Waggle Walkathon and Run for the Animals, I had the great pleasure to meet an unassuming young woman named Lydia Gagnon. Lydia is very pleasant, a little shy, but very special to the Ottawa Humane Society and the animals in our care. You see, for three years running, Lydia and her team, F.I.D.O. (Fun Independent Dog Owners) have been the top walkers in our walkathon. 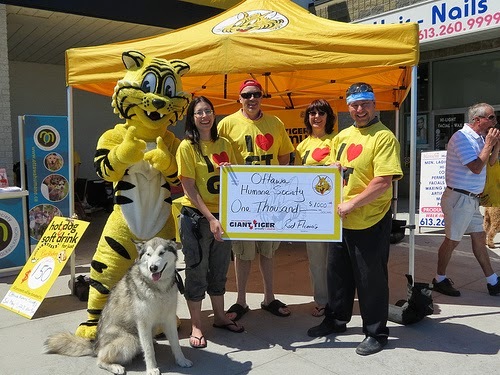 In fact, over the past seven years, the group has raised an astounding $19,516 and counting! pledges to help the animals. The walkathon is our biggest and most popular event of the year. Just seeing all the hundreds of dogs together, all shapes, sizes and breeds, is a sight to behold. Many come just to see the spectacle. Of course, the walkathon is a fundraiser—an essential one to help the OHS help the more than 10,000 animals that need our help every year. Having so many people come out is great, but they need to come with pledges in order to make a difference for the animals. That's where Lydia and her team come into this story. They work all year to collect pledges. They hold small events to raise funds. Helping the animals is a year-round activity for them and the results show in their individual and team totals and in the happy outcomes for the animals. Thank you Lydia; thank you team F.I.D.O. You are an inspiration. And thank you to all of you who have set up teams, donation pages, and have begun to collect gifts from your friends and family. The animals need you and you are there for them. See you on September 7!